High Arches and back pain are commonly linked together. 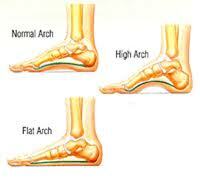 A high arch is also known as a supinated arch. Less common than a fallen or flat arch, a supinated arch can create a lot of jarring to the foot, ankle, knee, hip and low back. Back pain due to a pronated (fallen) or supinated (high) arch is no surprise. We look for this correlation at Vancouver Custom Orthotics and correct the kinetic chain with custom orthotic or orthopedic inserts.